Double Edge’s Artist Immersion program is for anyone looking for an in-depth experience of our training as the springboard for developing their own creative path of artistic inquiry and work creation. During a three-month residence at Double Edge’s rural Farm center, participants identify their research and develop the first stages of original material. 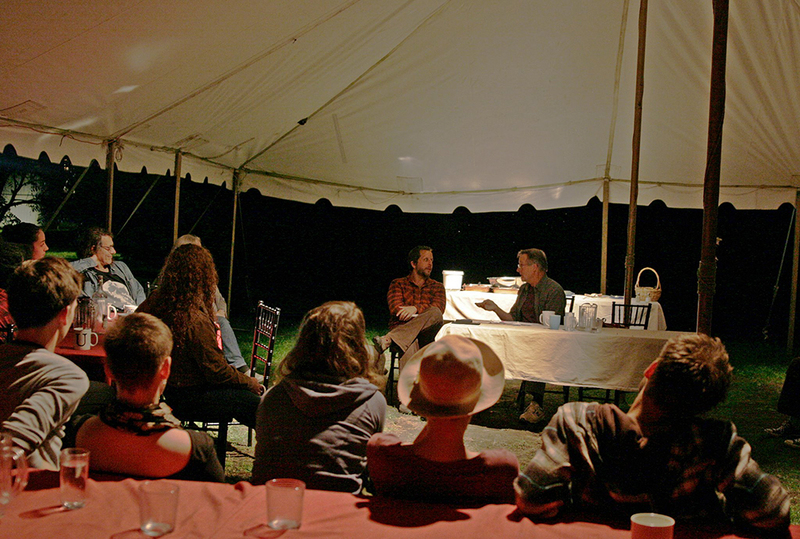 The program fosters an intimate and experiential connection to the larger fabric of the ensemble through work on the farm, gatherings with guest artists, rehearsal observation, and project participation based on the current work of the company. During the Fall 2019 session, Double Edge will present Leonora’s World, re-imagining and adapting this visually rich, surreal, and magical performance to the autumnal landscape across multiple sites at our Farm center - performing outside during the fall season for the very first time. Immersion artists will take part in all aspects of the performance project, experiencing first-hand Double Edge’s process of performance and outdoor work development. CLICK HERE to see a photo album from the 2017 Fall Immersion.